“There are events in the future, and not very far ahead, that will require all our faith, all our energy, all our confidence, all our trust in God, to enable us to withstand the influences that will be brought to bear against us. . . . We cannot trust in our intelligence; we cannot trust in our wealth; we cannot trust to any surrounding circumstances with which we are enveloped; we must trust alone in the living God to guide us, to direct us, to lead us, to teach us and to instruct us. And there never was a time when we needed to be more humble and more prayerful; there never was a time when we needed more fidelity, self-denial, and adherence to the principles of truth, than we do this day” (Quoted in Essential in Church History, Joseph Fielding Smith, 479). Soon afterwards, the battle that raged over the issue of polygamy would peak as nearly the whole nation turned against the Church. Legislation was passed which heavily persecuted the Saints in their practice of plural marriage. It had heretofore not been illegal, and, since the practice was wholly a part of their religion, the Mormons genuinely believed any law passed restricting it was unconstitutional. Several bills and acts were passed which progressively increased the persecution against the Saints, first making polygamy illegal, then making every individual act of cohabitation punishable, thus effectively, and illegally, allowing a person to be imprisoned for life for entering into a polygamous marriage. These laws, however, were made to apply only to Mormons, leaving anyone who committed adultery or fornication completely unpunished. The Saints were trying to be honorable in their commitments and were punished further for refusing to abandon their families. In the midst of this legal battle, as the Mormons appealed all the way to the Supreme Court, only to be ruled against, the United States government confiscated much of the Church’s property. The attorney general filed suits against the Church and the Perpetual Emigrating Fund Company. All property belonging to the two organizations was confiscated and the governernment took control of it. Though many men stood against this action in the face of intense public scrutiny, the measures went through solely due to the hatred and misunderstanding of the Church at this time. The Church was allowed to retain the use of some of its own buildings for a yearly rental. Despite the intensity of feeling and suffering at this time, the Saints rejoiced when they completed the building of the Logan Temple in 1884. Temple worship is an essential part of Mormon doctrine and the focus on building temples began with Joseph Smith and has never ceased. 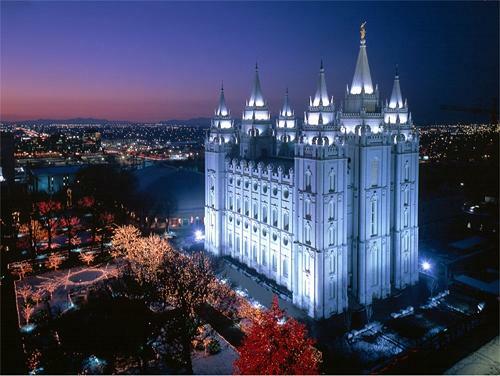 The Logan Temple was the second to be completed in Utah, after the St. George Temple was dedicated in 1877. The completion of the Logan Temple was of great significance for the Saints and was the cause of much rejoicing.